Already adapted as a hugely successful anime series, Hiroya Oku's manga Gantz gets a special effects-laden, live action makeover courtesy of director Shinsuke Sato (Sand Clock; All About My Dog) and Death Note trilogy producer Takahiro Sato. A hybrid of horror, action and science-fiction whose influences eange from likes of Men In Black and Ghostbusters to Battle Royale, Gantz stars Kazunari Ninomiya (Letters From Iwo Jima), Ken'ichi Matsuyama (Norwegian Wood; Kamui; the Death Note trilogy) and popular Japanese TV star Natsuna. Teenage high school student Kei Kurono (Ninomiya) is waiting for a subway train home when he recognizes an old childhood friend Masaru Kato (Matsuyama) on the same platform. Suddenly, a drunken commuter falls on the tracks just as the station's speaker system announces the approach of a non-stopping express train. Kato immediately goes to the man's assistance but struggles to lift him to safety on his own. Reluctantly, Kurono joins him and they manage to save the man but are unable to get clear of the oncoming train, which hits them and kills them instantly. A split second later, Kurono and Kato find themselves in a bare room in an unfurnished apartment containing several strangers and a large, black spherical object. They quickly discover that all the people in the room have recently died and been instantly resurrected by the mysterious sphere. But their second chance at life comes at a price. To remain alive, those chosen must follow the sphere's instructions in seeking out and destroying numerous bizarre alien life forms secretly inhabiting the earth. But what it the origin of the sphere, how is it able to restore life to the dead and what does it want? Gantz (cert. 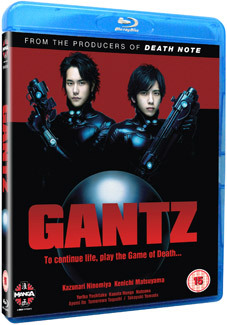 15) will be released on DVD (£19.99) and Blu-ray (£24.99) by Manga Entertainment on 3rd October 2011.